- Fits Harley-Davidson Sportsters 1982 - 2003, perfect, flawless fit. 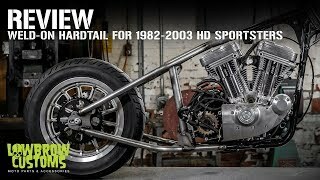 This weld-on hardtail rear frame section from Lowbrow Customs is an absolute perfect fit on stock 1982 - 2003 Sportsters (stock front frame section not included). These hardtails are a 3 inch stretch and 1 inch drop compared to a stock Sportster. This means axle-to-axle the hardtailed bike will be 3 inches longer, and have 1 inch less ground clearance. This is the perfect blend of style and performance. Frames are 100% professionally TIG welded. Proudly made in Cleveland, Ohio, USA. Installation is easy and takes only an afternoon. All tubing matches the stock frame tubing diameter, with a 1-5/8 inch backbone and 1-1/4 inch diameter lower rails. This blends the installed hardtail seamlessly into your stock frame. Using a hardtail section allows you to keep the original VIN number and title. The stock frame is simply cut and the hardtail slid in place using the pre-installed slugs. The upper slug is tubing and allows any wiring (headlight, handlebar switches) to be run through the backbone of the frame, exiting right above the battery box and oil tank. The lower slugs are solid steel and are machined to be a perfect fit inside the lower frame rails. A 1/4 inch thick brake stay tab is included but not welded in place. Based on what style rear brake is used, aftermarket or stock, year range of stock components, etc, the location of the brake stay tab can change. The entire rear motor mount area is designed to be as strong as possible and will handle any motor no matter how built. The rear motor mount bolts are very easy to access with our unique design, which adds to the ease of installation. Rear axle plates have doublers welded in place so the rear axle is a perfect fit (and also looks great). The doublers have another purpose, which is that they are the only spot your axle head and axle nut touch on the frame, saving the rest of the frame's paint when adjusting the rear wheel and chain. Integrated in the axle plate design are convenient 3/8 inch holes for rear fender struts. Each hardtail includes a set of axle adjusters that will work with stock 3/4 inch rear axles. The adjusters tuck in behind the axle plates, keeping them hidden, and they are adjusted from the rear of the axle plate. This is very similar to an Ironhead Sportster setup, which allows the rear wheel and chain to be adjusted with ease while keeping everything copasetic.